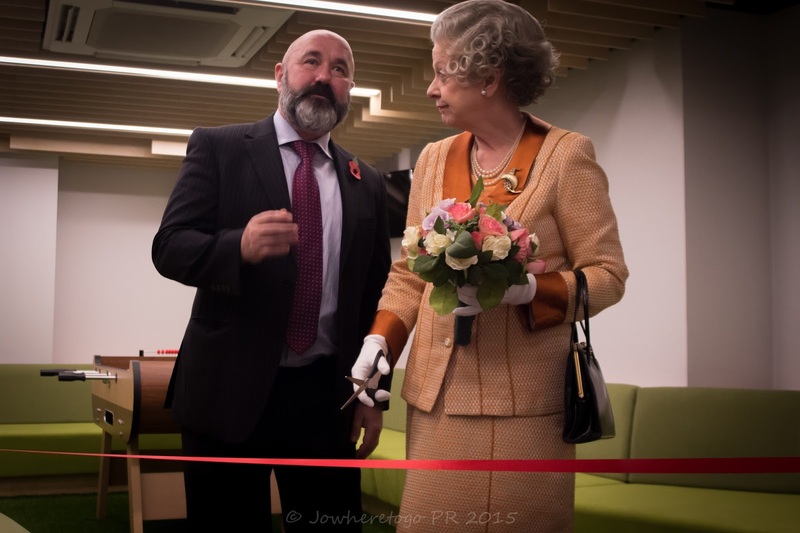 THEATRE ROYAL CELEBRATES NEW FACILITIES WITH ‘ROYAL’ OPENING BY ‘THE QUEEN’! 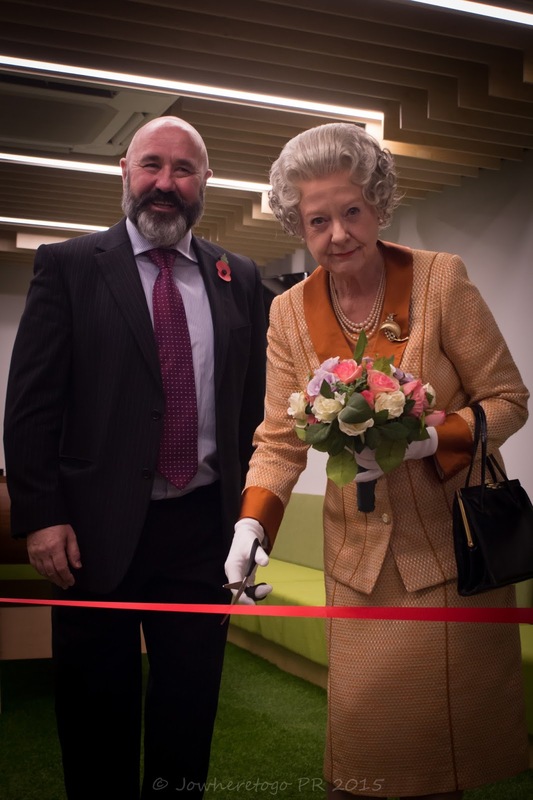 Double award-winning Newcastle Theatre Royal has officially unveiled its £600,000 backstage refurbishment by inviting ‘the Queen’ along to perform an official ribbon cutting ceremony. The grand unveiling comes just as the theatre is celebrating a double national award win for its welcoming atmosphere. Newcastle Theatre Royal was named the My Theatre Matters! UK’s Most Welcoming Theatre of 2015 in the UK Theatre Awards, in association with Smooth Radio and was also presented with the Technical Theatre Awards’ ‘Receiving Venue Team of the Year’ just this month. 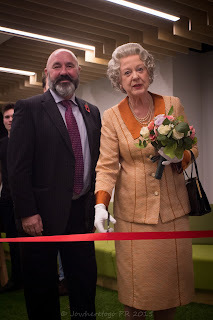 Staff at the theatre, decided that having ‘the Queen’ on stage all week in hit comedy Handbaggedwas too good an opportunity to miss and asked actress Susie Blake, who plays the role, if she would pop along in costume to officially unveil the newly refurbished facilities. The backstage refurbishment has seen the theatre invest £600,000 in improved Dressing Room facilities, stripping out and renewing all the Dressing Rooms, the Band Rooms for musicians, the laundry, wardrobe and wigs rooms, and improved access and facilities for disabled performers. The ground floor has also been reconfigured with a striking new Stage Door area, and a brand new Green Room, with TV, wi-fi and a football table, and a kitchenette so visiting actors eat and relax in comfort. Newcastle Theatre Royal’s Chief Executive, Philip Bernays, added: “It’s great fun to have ‘the Queen’ here for our official opening ceremony today, but on a serious note the investment in our backstage facilities plays an important part in being able to attract the finest companies to the Theatre Royal so that our audiences can enjoy top quality theatre. 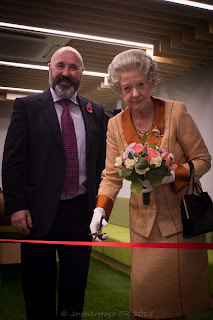 ‘The Queen’ was joined at the official ceremony by ‘Margaret Thatcher’ played by fellow actress Kate Fahy and the pair posed for comedy shots in the new Green Room at Newcastle Theatre Royal while putting the new facilities to the test. 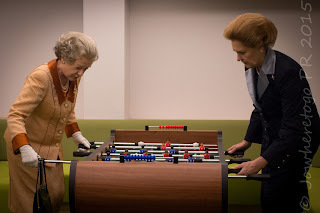 The two actors, who play the lead roles in the award-winning comedy Handbagged, will be using the facilities for real all week as the hit comedy plays to Newcastleaudiences. Handbagged is Moira Buffini’s celebrated new comedy, which speculates on what the Queen and Margaret Thatcher really talked about behind closed palace doors. When the stiff upper lip softened and the gloves came off, which one had the upper hand? Photography by Joanne Oliver for www.JoWhereToGo.com photography. Follow Jowheretogo on Twitter https://twitter.com/JoWhereToGo& Facebook www.facebook.com/Jowheretogo. 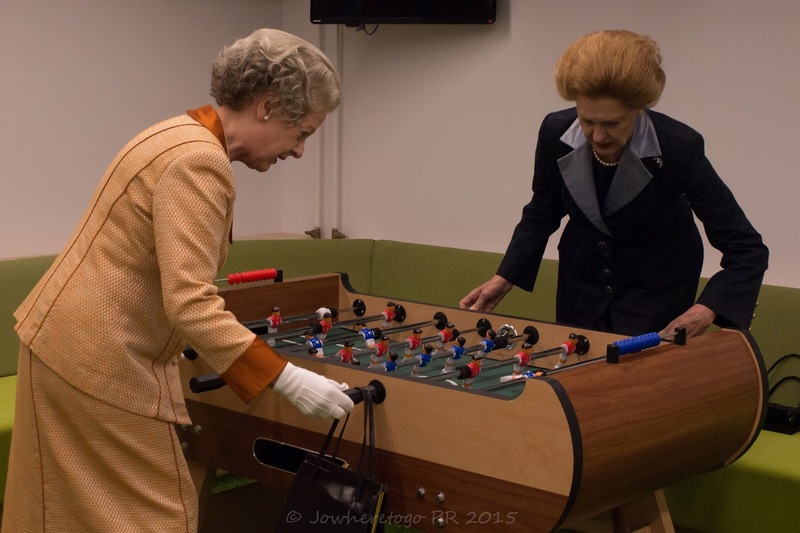 Handbagged plays at Newcastle Theatre Royal until Saturday 31 October. Tickets are from £12 (save 50p per ticket when you book online) and can be purchased from the Theatre Royal Box Office on 08448 11 21 21 (calls cost 7ppm plus your phone company’s access charge) or book online at www.theatreroyal.co.uk.